Is The Hobbit: Battles of the Five Armies too intense for your child? Angela Hoover has the bottom line on this week’s Mom’s Movie Minute. Which movie's right for you this weekend? Annie? Night at the Museum: Secret of the Tomb? 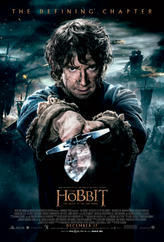 The Hobbit: The Battle of the Five Armies? Fandango Chief Correspondent Dave Karger breaks them down with a little help from Martin Freeman. We’ll talk wizards, dragons, and Middle Earth in this week’s Hobbit episode of Reel Kids. Looking for movie tickets? Enter your location to see which movie theaters are playing The Hobbit: The Battle of the Five Armies near you.